We support clients with detailed and rigorous understanding of their risks, particularly Environmental, Social and Governance (ESG) risks, while keeping sight of related risks such as security – and the linkages between them. We believe risk cannot be addressed in ‘silos’ as too often it is the combinations of risks that are the most toxic – and which clients need to be aware of. 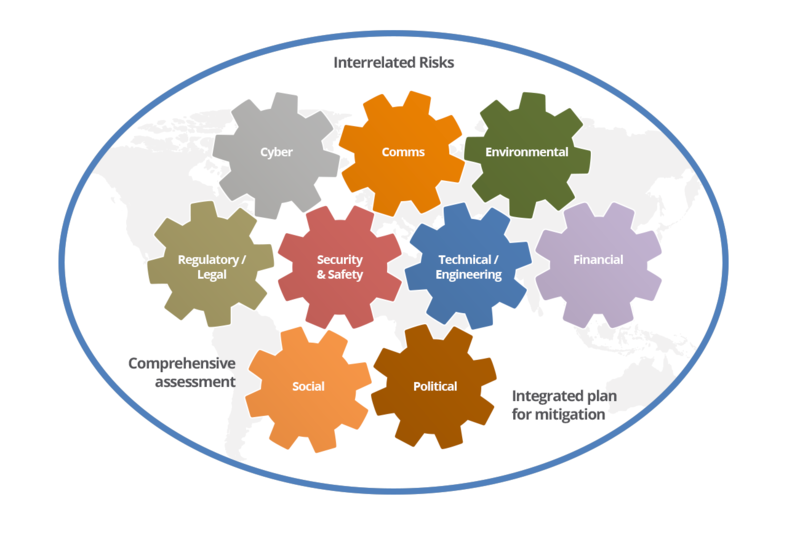 As a result, we take a comprehensive ‘360 degree’ approach that looks at financial, technical, political, social, reputational, regulatory, security (including cyber), environmental risks etc. The output from our risk assessments is a comprehensive report and, if required, detailed risk register, prioritising risks based on likelihood and impact to your strategy. The risk report prioritises risks, identifies interdependencies and sets out ways to mitigate those risks. If required, we will then work with our clients to design an integrated risk management strategy.